1. 1	Simquip of Queensland, Australia is a manufacturer of Boeing and Airbus industries Simulated parts. In this context the term 'simulated parts' refers to the process of manufacturing flightdeck components including furnishings, fittings, panels, structures and others applicable to the simulation of aircraft flight-decks. 2. 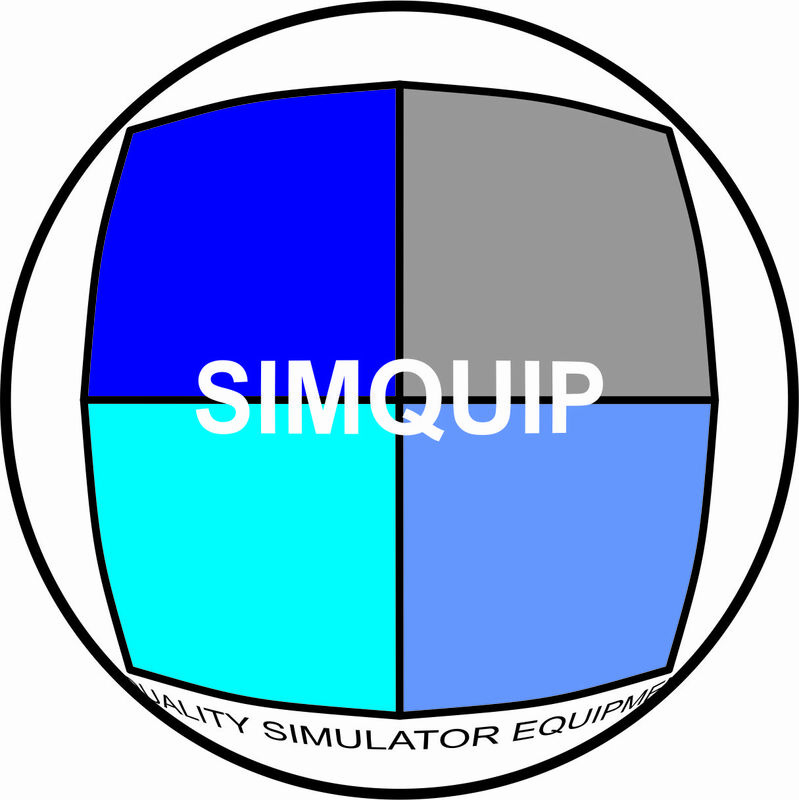 2	Simquip makes claim only to the accuracy and operation of its manufactured items and their operation.All assemblies and parts manufactured by Simquip are sold for the express purpose of use in flight training equipment and the like. 3. 3	Simquip is not affiliated to or endorsed in any way by the Boeing Aircraft Company or Airbus Industrie. 4. 4	Simquip acknowledges that while a high degree of visual and functional fidelity exists throughout its products it also states clearly that it is strictly forbidden to use any of its products on any airworthy aircraft regardless of the operational jurisdiction. 5. 5	it is strictly forbidden to use any of its products on any airworthy aircraft. THE WEB SITE AND THE CONTENT IS PROVIDED "AS IS". WHILE SIMQUIP ENDEAVOURS TO PROVIDE INFORMATION THAT IS CORRECT, ACCURATE AND TIMELY, SIMQUIP MAKES NO REPRESENTATIONS OR WARRANTIES, EXPRESS OR IMPLIED, REGARDING THE WEB SITE AND THE CONTENT INCLUDING, WITHOUT LIMITATION, NO REPRESENTATION OR WARRANTY THAT (I) THE CONTENT CONTAINED IN OR MADE AVAILABLE THROUGH THE WEB SITE WILL BE OF MERCHANTABLE QUALITY AND FIT FOR A PARTICULAR PURPOSE, (II) THE WEB SITE OR CONTENT WILL BE ACCURATE, COMPLETE, CURRENT, RELIABLE, OR TIMELY, (III) THAT THE OPERATION OF THE WEB SITE WILL BE UNINTERRUPTED OR ERROR-FREE, (IV) THAT DEFECTS OR ERRORS IN THE WEB SITE OR THE CONTENT, BE IT HUMAN OR COMPUTER ERRORS, WILL BE CORRECTED, (V) THAT THE WEB SITE WILL BE FREE FROM VIRUSES OR HARMFUL COMPONENTS, AND (VI) THAT COMMUNICATIONS TO OR FROM THE WEB SITE WILL BE SECURE AND/OR NOT INTERCEPTED. SUBJECT TO APPLICABLE LAW, IN NO EVENT SHALL SIMQUIP, ITS OFFICERS, DIRECTORS, EMPLOYEES, AGENTS, LICENSORS, AND THEIR RESPECTIVE SUCCESSORS AND ASSIGNS BE LIABLE FOR DAMAGES OF ANY KIND, INCLUDING, WITHOUT LIMITATION, ANY DIRECT, SPECIAL, INDIRECT, INCIDENTAL OR CONSEQUENTIAL DAMAGES INCLUDING, WITHOUT LIMITATION, ANY LOSS OR DAMAGES IN THE NATURE OF, OR RELATING TO, LOST BUSINESS, LOST PROFIT, BUSINESS INTERRUPTION, INACCURATE INFORMATION, OR ANY OTHER LOSS INCURRED IN CONNECTION WITH THE USE OR MISUSE OF THE WEB SITE, REGARDLESS OF THE CAUSE AND WHETHER ARISING IN CONTRACT (INCLUDING FUNDAMENTAL BREACH), TORT (INCLUDING NEGLIGENCE), OR OTHERWISE. THE FOREGOING LIMITATION SHALL APPLY EVEN IF SIMQUIP KNEW OF OR OUGHT TO HAVE KNOWN OF THE POSSIBILITY OF SUCH DAMAGES. The Content is protected by copyright law, and is owned by SIMQUIP, its licensors, and/or the party accredited as the provider of the Content. Except as granted in the limited license herein, any use of the Content, including modification, transmission, presentation, distribution, republication, or other exploitation of the Web site or of its Content, whether in whole or in part, is prohibited without the express prior written consent of SIMQUIP. SIMQUIP and SIMQUIP & Design are trademarks of SIMQUIP. Other names, words, titles, phrases, logos, designs, graphics, icons and trademarks displayed on the Web site may constitute registered or unregistered trademarks of SIMQUIP or third parties. While certain trademarks of third parties may be used by SIMQUIP under license, the display of third party trademarks on the Web site should not be taken to imply any relationship or license between SIMQUIP and the owner of the trademark or to imply that SIMQUIP endorses the wares, services or business of the owner of the said trademark. The Web site may contain links to third-party web sites. These links are provided solely as a convenience to you and not as an endorsement by SIMQUIP of the contents of such third-party web sites. SIMQUIP is not responsible for the content of any third-party web site, nor does it make any representation or warranty of any kind regarding any third-party web site including, without limitation, (i) any representation or warranty regarding the legality, accuracy, reliability, completeness, timeliness or suitability of any content on such third-party web sites, (ii) any representation or warranty regarding the merchantability and fitness for a particular purpose of any material, content, software, goods, or services located at or made available through such third-party web sites, or (iii) any representation or warranty that the operation of such third-party web sites will be uninterrupted or error free, that defects or errors in such third-party web sites will be corrected, or that such third-party web sites will be free from viruses or other harmful components. While SIMQUIP encourages links to the Web site, it does not wish to be linked to or from any third-party web site which contains, posts or transmits any unlawful information of any kind, including, without limitation, any content constituting or encouraging conduct that would constitute a criminal offence, give rise to civil liability or otherwise violate any local, state, provincial, national or international law, regulation which may be damaging or detrimental to the activities, operations, credibility or integrity of SIMQUIP or which contains, posts or transmits any information, software or other material which violates or infringes upon the rights of others, including material which is an invasion of privacy or publicity rights, or which is protected by copyright, trademark or other proprietary rights. SIMQUIP reserves the right to prohibit or refuse to accept any link to the Web site, including, without limitation, any link which contains or makes available any content or information of the foregoing nature, at any time. You agree to remove any link you may have to the Web site upon the request of SIMQUIP. Any comments or materials ("Submissions") that you send to SIMQUIP shall be treated as non-confidential unless otherwise agreed between you and SIMQUIP in writing. You hereby grant SIMQUIP a royalty-free, perpetual, non-exclusive, irrevocable, unrestricted, worldwide license to (i) use, reproduce, store, adapt, translate, modify, make derivative works from, transmit, distribute, publicly perform or display such Submissions for any purpose, and (ii) to sublicense to third parties the unrestricted right to exercise any of the foregoing rights. In addition to the grant of the above license, you hereby (i) agree to waive all moral rights in your Submission in favour of SIMQUIP, (ii) consent to your name, address and e-mail appearing as the contributor of your Submission, where applicable, and to the disclosure and display of such information and any other information which appears in or is associated with your Submission, (iii) acknowledge and agree that SIMQUIP is not responsible for any loss, damage or corruption that may occur to your Submission, and (iv) acknowledge and agree that your Submission will be non-confidential. Any information sent or received over the internet is generally un-secure. SIMQUIP cannot guarantee the security of any communication to or from the Web site. This Agreement constitutes the entire agreement between you and SIMQUIP with respect to the subject matter hereof. This Agreement shall inure to the benefit of, and be binding upon you and SIMQUIP and each of our respective successors and assigns. The invalidity or un-enforceability of any provision of this Agreement or any covenant contained herein shall not affect the validity or enforceability of any other provision or covenant contained herein and any such invalid provision or covenant shall be deemed severable from the rest of this Agreement. By accessing or using the Web site, you agree that all matters relating to your access to, or use of the Web site and its Content shall be governed by the laws of the Commonwealth of Australia, without regard to conflict of laws principles. You agree and hereby submit to the exclusive jurisdiction of the Federal Court of Australia and/with respect to all matters relating to the Website. At SIMQUIP, your privacy is important to us. SIMQUIP is committed to providing visitors with websites that respect their privacy. This statement sets out our privacy practices with respect to the collection, use and disclosure of personal information on this site. This site may contain links that take you to other websites. This privacy statement does not extend to the data collection practices of third parties and SIMQUIP does not assume any responsibility for the privacy practices, policies or actions of third parties. You should read the individual privacy policies and/or legal notices of such sites and make an informed decision as to whether or not you wish to use these sites based on their privacy practices. SIMQUIP will never disclose, sell or lease to any third party other than our affiliates, either free of charge or for remuneration, any personal information that you provide on this site without your permission, unless we are required to do so by law. Notwithstanding this, certain sections of this website could be activated and hosted by a third party. Accordingly, the personal information provided to us through these sections will be available to such third party, its affiliated companies and authorised sub-contractors for the limited purposes of hosting and administering these particular sections. If you submit an e-mail inquiry to this site, any personal information you might submit at the same time will only be used by SIMQUIP employees or its affiliates who need to have access to it in order to respond to your inquiry. SIMQUIP's Web Server may collect visitor information regarding which pages are accessed. This information is used internally, only in aggregate form, to better serve visitors by helping SIMQUIP to manage its websites, diagnose any technical problems and improve the content of its websites. Your personal information is treated as private, confidential information by SIMQUIP and we strive to ensure that your personal information is protected at all times. However, even though SIMQUIP has implemented methods designed to ensure the protection of your personal information that are considered to be effective, we cannot guarantee that such information will not be lost, used unlawfully or modified in a fraudulent manner since no data transmission over the Internet can be guaranteed to be completely confidential. Consequently, SIMQUIP bears no liability for the use that may be made of the information by you or any third party. SIMQUIP reserves the right to change this privacy statement as it sees fit and without prior notice. However, we will ensure that any change to this statement is in compliance with the laws in effect in Australia with regard to this subject matter and posted on this page. We encourage you to refer back to this privacy statement regularly. Please note that the English version of SIMQUIP's Internet Privacy Statement have legal value.For a more detailed privacy please click on the 'privacy' tab on this page. If you have any comments, questions or complaints regarding SIMQUIP's privacy statement or practices, please send an email to webmaster@SIMQUIP.com. Questions or comments regarding the Web site should be directed by e-mail to webmaster@SIMQUIP.com. © 2012, SIMQUIP All rights reserved. Certain sections of the Web site may contain forward-looking statements involving risks and uncertainties. These may include, but are not limited to, quarterly fluctuations in results, timely availability and customer acceptance of new products, the impact of competitive pricing and products, general market trends and conditions, and other risks detailed in SIMQUIP's Annual Information Form and the Management Discussion and Analysis portion of SIMQUIP's Annual Report. Actual results may vary materially from projected results. SIMQUIP is committed to respecting your privacy. Any personal information you choose to provide will only be used or disclosed as set out in this policy or otherwise with your consent. SIMQUIP Pty Ltd will, at all times, collect personal information in a fair and lawful manner. Where possible, we will collect your personal information directly from you, either through our stores or our website. The SIMQUIP website records information about your use of the website. The personal information we collect is necessary for our key activities of providing an online shopping facility and an interactive website, which allows you to interact and share information with others via our facilities. Whenever a page is requested from our web server, we record the search terms entered, time, date and URL of the request, along with information on the browser software that is being used. This information is used to analyse the way in which people utilise our website, enabling us to improve our services and is not used in any way to uniquely identify a customer. Our website is directed to persons over the age of 18 years old. We do not knowingly collect personal information from anyone younger than this. SIMQUIP may make chat rooms, forums, and message boards available to our website users. Please remember that any information that is disclosed in these areas becomes public information and you should think carefully before deciding to disclose your personal information. The SIMQUIP-MFDE website may contain links to other websites. SIMQUIP is not responsible for the privacy practices or the content of such websites. In order to deliver the services to you, we may disclose your personal information to organisations outside of SIMQUIP, like mailing houses and research consultants. Your personal information is disclosed to these organisations only in relation to us providing our services to you. We take reasonable steps to ensure that these organisations are bound by confidentiality and privacy obligations for the protection of your personal information. We may disclose your personal information to related companies. We may also disclose your personal information to our professional advisors, like accountants, lawyers and auditors. We will disclose your personal information if required by law, for example, to government and regulatory authorities. SIMQUIP has taken reasonable steps to make sure that your personal information is protected from any unauthorised access or disclosure. Shipping must be prepaid prior to dispatch unless organised by the client using their preferred shipping arrangements. Unless otherwise requested, shipping is usually included in the purchase invoice or via the web payment system. Prices do not include Local taxes and import duty. door- to- door services are not available on large items shipped via airfreight unless otherwise agreed upon in writing. Delivery times exclude actual shipping times and are indicative of the lead times to manufacture the item and have it ready for dispatch. Any Purchaser wishing to secure a discounted item or any offer must make a deposit of 50% of the total order. Once the order is ready for delivery the balance of the purchase price (50%) is required to release the goods for delivery. If you require an alternate payment method for any purchased products, please contact us to arrange your preferred method. Which payment method should I use. When completing a payment transaction, the question of which method should I use arises. There are 3 primary methods you can use to pay Simquip. PayPal is one of the fastest and secure methods available for international transfers today. It allows you to use all major cards and provides high security by not exposing your bank or credit card details to even the vendor. If you need to transfer funds quickly, PayPal payments are usually instant and Simquip will receive acknowledgement of your payment the next business day. Today most banks have internet banking and facilities to allow you to perform an International bank deposit directly from your account to the receiving account. Performing a transfer such as this can take from 1 to 5 days depending on the transferring and receiving bank. The advantage of using a bank to bank transfer is that the costs are very small when compared to Paypal, whereas Paypal may charge several hundred dollars on large amounts, a direct bank deposit may be as little as $10 for the same service. A cheque or check is a less convenient, less secure, but low cost method of transferring funds to another account. Typically a cheque takes up to 35 days to clear. We cannot commence work on any order without clear funds to proceed. If you have the time to spare, this is definitely the cheapest way to get funds from point A to B, but there are not to many businesses who want to add 1 month onto production lead time. Sending a cheque is the least desirable method of payment. ∞	•	Log onto your PayPal account. ∞	•	Click on the ‘send money’ tab at the top of the page. ∞	•	Important: Include a note on the Paypal payment form describing what the payment is for. ∞	•	Complete the rest of the form and funds should be on the way. When possible, SIMQUIP usually ships using the postal service as this is the most time/cost effective way to get products to you Postage is charged at checkout time and does not appear on the product prices. Where Postal shipping is not practical on large items, we usually recommend using sea freight, however this may not be suitable for tight lead times. In situations requiring International airfreight, pricing includes shipping to the nearest International airport only. Due to the logistical complications of worldwide delivery, we cannot always provide a door-to-door service for airfreight on large items. Shipping must be prepaid prior to dispatch unless organised by the client using their preferred shipping arrangements. Many of our items are marked "delivery:7 days" or "dispatch:immediate" etc. This means that the item will be ready for shipping or dispatch in the time specified. Dispatch:immediate means that the item will be ready for immediate dispatch once payment has been received. This is usually within 24 hours of receiving payment in full. We pride ourselves on packing products top be shipped in a suitable, protective manner so that your goods arrive in a new and undamaged manner regardless of their size.Large items such as seats and flight controls are secured to customised pallets for maximum protection. From time to time shipping quotations may change and shipping companies may charge in excess of the prices published on our website.We reserve the right to alter any shipping quote in line with changes from our shipping contractors. If there are any changes to shipping prices quoted on the web, customers will be notified immediately. If you require an alternate shipping method for any purchased products, please contact us to arrange your preferred method. 1.1 Please read these terms and conditions carefully before using the website operated by SIMQUIP. WE provide you the customer (YOU) with an on-line shopping service whereby YOU may purchase Products from us, subject to the following Terms and Conditions of Sale (Conditions). WE reserve the right to change any of these Conditions, with such changes effective immediately upon posting to our Website. It is YOUR responsibility to check for any changes before using our website. 3.1 To order a Product YOU will need to follow the ordering procedures set out on our payment tab. Details of our prices for the Products, and the procedures for payment and delivery are displayed on our website. 3.5 By shopping on our Website, YOU are responsible for maintaining the confidentiality of Your Paypal Account and Your Password, and YOU agree to accept responsibility for all activities that occur using Your Paypal Account or Your Password. YOU agree that it is your responsibility to maintain the security of your account at all times. 3.12 All documents issued by us and posted on our Website, including price lists, are in Euros (EUR) unless otherwise expressly stated. All payments by YOU to us must be made in Euros (EUR) unless otherwise specifically agreed. 4.2 Your account will be charged for delivery of the Products. If YOU are not available to accept delivery of any Products, there may be additional freight costs associated with re-delivery. These costs, if any, will be your responsibility. 4.4 It is Your responsibility to check the quantity, quality and description of the Products delivered against the details on the delivery slip. If there is any difference in quantity, quality or description of the Products delivered, YOU must notify us at sales@ Simquip.com within 48 hours from the time of delivery. If notice is not given within 48 hours, the Products actually delivered shall be deemed to be in accordance with the delivery slip and you shall not be entitled to make any claim or take any action in relation to any alleged deficiency or irregularity in the Products after that time. 6.1 Unless otherwise agreed by us in its absolute discretion, all Products are sold on a return for repair,replacement or credit basis, unless Subject to this clause , the Products are received in a damaged state; or Subject to the requirements of clause 3.4, the Products are supplied in the incorrect quantity; incorrect Products are supplied to YOU; or the Products are faulty. 6.3Claims for credit must be made within seven (7) days of receipt or collection of the Products by YOU by emailing sales@ Simquip.com A copy of the delivery slip from which the Products were supplied must be presented, failing which any such claims are deemed to be waived. 7. WE will, at our discretion, honour the standard manufacturer warranties.¬ Each individual product will have its own manufacturer warranty period & each product will have its warranty period judged individually, irrespective of if the products were originally ordered in a group. 11.8 Without derogating from any other term or condition in these Conditions: (a) YOU shall inspect the Products immediately upon their delivery in accordance with clause 4. The Products are deemed to be accepted by YOU unless YOU give notice to us of any alleged defects in the Products, unfitness for the particular purpose for which they were supplied (if any), un-merchantable quality, or failure to meet specifications within 48 hours of delivery of the Products. (b) In default of such notice, the Products shall be deemed to be suitable for the purpose for which they were supplied, of merchantable quality, in accordance with specifications, and otherwise free of any defect and Next Byte shall not recognise any claim in any of these regards. 12.5 WE shall use our best Endeavour’s to quickly and effectively resolve any dispute arising in relation to Your visit to Simquip.com, any Products purchased via Simquip-Messler.com or these Conditions. In the event of a failure to resolve any such dispute, the dispute shall be governed by and dealt with under the laws of Queensland, Australia and YOU and US submit to the non-exclusive jurisdiction of the courts and tribunals of Queensland, Australia. Simquip's warranty policy covers all parts, assemblies and software including data supplied via its SDS service. Simquip endeavours to provide a no-nonsense guarantee of quality, so that all purchasers may relax in the knowledge that everything purchased through this web store is covered by a comprehensive replacement or refund warranty. Unless otherwise stated, all products sold by Simquip come with a 12 month warranty. This statement of warranty seeks to explain the warranties and guarantees provided by the Simquip for its products either manufactured, assembled or supplied to any purchaser . Simquip will be known hereon as “the vendor” whilst the purchaser will be known hereon as “the purchaser”. The purchaser although specific in application of this document will be abstract and will not be referred specifically in this document. The vendor warrants all parts manufactured by it against defects and faults for a period of no less than 12 months from time of delivery to the purchaser’s location. This includes assemblies supplied by the vendor and the scope of this warranty covers defects and faults in the construction of the assembly such as mis location of parts and sub assemblies within the above mentioned assembly. The vendor does not warrant any parts or assemblies that have not been paid for in full by the purchaser or have exceeded the period of warranty set out by this document. All parts and assemblies supplied by the vendor as a direct result of a warranty claim will resume a full warranty period from the date that they were re-supplied to the purchaser but this does not apply to repairs made to parts or assemblies still covered by this warranty. All parts supplied by the vendor but not manufactured by it will be repaired or replaced by the vendor as is permitted by the manufacturer or supplier of the above said part but excludes all parts with warranty periods of a lesser time than set out in this warranty document. The vendor does not warrant or guarantee the replacement or repair of any assembly or part that it deems has been the subject of any abuse, overload or use beyond the scope of its intended design or operation. The vendor may elect to have the part(s) and assembly(s) that are the subject of a warranty claim inspected and/or repaired by a third party of its choosing. If at any time the vendor refuses the repair or replacement of any part or assembly as a result of a warranty claim instigated by the purchaser. The vendor will supply reasonable information and evidence as to why any claim is refused and to provide reasonable opportunity for the purchaser to have the part or assembly repaired by it or an agreed third party repairer. This warranty is “return to base” type and therefore the purchaser must at their expense pay for packaging and transport to the vendor’s location for the purpose of assessment and repair, however the vendor at its discretion may elect to have the part(s) assessed and repaired by a suitable agent provided that the costs incurred by the transport to such repairer does not exceed that of returning the part(s) to the vendor’s location. Simquip's warranty is on a 'return to base' system. If we are unable to provide a solution for repair or the like, We require that the item in question be returned to our manufacturing facility at the claimants expense unless otherwise agreed upon.To return any item or product for warranty claim, the claimant should fill out an electronic warranty claim form (EWCF) Simquip will then respond by issuing a claim response directive which will instruct the claimant how to return the item for refund, replacement or repair. If so requested by the claimant a refund may be issued on any non- customised part or assembly. this will be undertaken at the discretion of Simquip. Shipping of any returned part or assembly will be done at the claimants expense. In some cases Return to Simquip's manufacturing facility may be at the expense of Simquip, but this would be at Simquip's discretion. Shipping of any repaired or replaced part or assembly is to be at the senders expense. However Simquip May elect at its discretion to provide for the return of any such part at its expense.